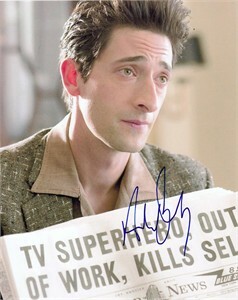 8x10 photo from the 2006 movie Hollywoodland autographed in blue marker by Oscar winning actor Adrien Brody. Obtained in person at celebrity event. With certificate of authenticity from AutographsForSale.com. ONLY ONE AVAILABLE FOR SALE.